Last July, U.S. Congressman David N. Cicilline, who serves on the House Judiciary Antitrust Subcommittee, called for a hearing on Amazon’s proposed $13.7 billion acquisition of Whole Foods. The Congressman claimed he was not “taking a position on the legality” of Amazon’s attempt to purchase Whole Foods. In fact, his letter noted that “several leading antitrust scholars” had suggested the merger would be beneficial to consumers. The letter, however, was not so much about the merger itself. Instead it was an attempt to convince the antitrust subcommittee to jump over analysis of relevant markets, prices, and consumer welfare and go straight to speculation about small business, labor markets, and income inequality. This sort of speculation is a key component of the populist antitrust movement. Simply saying that Amazon has grown like a weed, charges very low prices, and has driven many smaller retailers out of business is not sufficient. Where is the consumer harm? On its face, there was nothing about the Amazon/Whole Foods merger that should have raised any antitrust concerns. Stock prices provided no meaningful information regarding the competitive impacts of the merger. While one year is too soon to fully judge the competitive impacts of the Amazon-Whole Foods merger, nevertheless, it appears that much of the populist antitrust movement’s speculation that the merger would destroy competition and competitors and impoverish workers has failed to materialize. Citing the Wall Street Journal, Cicilline’s letter noted that Amazon accounts for “more than half of online food orders through its Fresh, Prime and Prime Now services.” Also in the article, but missing from Cicilline’s letter, is the observation that (1) grocery delivery accounted for less than 2 percent of food retail sales in 2016 and (2) grocery delivery is concentrated in cities and surrounding suburbs. Over the past year, the U.S. saw $5.2 trillion in retail sales, according to the Census Bureau. Whole Foods has less than 1.5 percent of the food retail market, or about 0.2 percent of total retail sales. About 20 percent of Whole Foods’ sales are prepared foods and 15 percent of its revenues come from its exclusive brands such as 365 Everyday Value. Amazon accounts for one-tenth of one percent of U.S. grocery sales. Viewed as a merger of two food retailers, Amazon’s purchase of Whole Foods would be characterized correctly as a horizontal merger. With each firm comprising a small portion of the retail food market, it should have been—and was—presumed the merger would not harm competition, nor would it result in consolidation of the retail sector. Even critics of Amazon’s size and conduct had concluded the merger would likely benefit consumers. For example researchers at the Roosevelt Institute concluded, “Amazon will likely aim to expand the reach of the Whole Foods brand by lowering prices.” Indeed, soon after the merger closed, Whole Foods slashed the price of staples such as organic produce. Cicilline’s letter speculated Amazon’s competitive advantages in terms of size, consumer reach, and ability to absorb losses could discourage innovation and entrance of firms in the areas of grocery and food delivery. Since United States v. Grinnell Corp., antitrust policy has given safe harbor to firms that obtained market share “as a consequence of a superior product, business acumen, or historic accident.” In can easily be argued that Amazon’s consumer reach is due in a large part to offering a superior product in the form of a easy-to-use interface for both buyers and sellers, business acumen in the development of a superior system of distribution and logistics, as well as the historic accident of being an early entrant into the market during the dot-com boom. Economies of scale, in some situations. The entry and growth of Instacart, Uber Eats, and Postmates, are evidence that Amazon’s size, consumer reach, and ability to absorb losses has not presented any barriers to entry of new firms or the expansion of existing firms into the retail food delivery business. The Wall Street Journal reports that since the merger, several grocers have added online ordering while hundreds of health food stores have seen increased dollar and unit sales from a year ago. Trader Joe’s and Aldi have also experienced strong sales growth since the merger. Cicilline’s letter asserted that Amazon’s purchase of Whole Foods would enable Amazon to prioritize its products and services over competitors. Critics of Amazon’s behavior claim such prioritization was already occurring before the merger. Cicilline’s letter provided no mechanism by which the merger in and of itself would increase such prioritization, or even if such an increase could be measured. Even so, the letter fails to address the key issue of whether prioritization is an anticompetitive act. If it is, then just about every major food retailer in the U.S. is behaving anticompetitively. In 1997, Whole Foods launched its 365 Everyday Value line of products. Five years later, it launched its 365 Organic Everyday Value line. These products are given prominent shelf space and are often featured in promotional “end caps” in Whole Foods stores. In 2015, Whole Foods introduced 365 by Whole Foods Market, a concept store based on the 365 Everyday Value brand. The pre-merger photo below shows how Whole Foods prioritized its own brands within its stores, with placement at eye-level and in promotional islands. Costco provides prominent shelf space to its own Kirkland branded products. Most of the products sold in Trader Joe’s stores carry the company’s private label. Kroger has a number of private label brands, including Private Selection and Simple Truth as well as value brands such as Psst and Heritage Farms. Kroger frequently promotes Private Selection and Simple Truth with advertising, coupons, and other promotions including prominent shelf space. 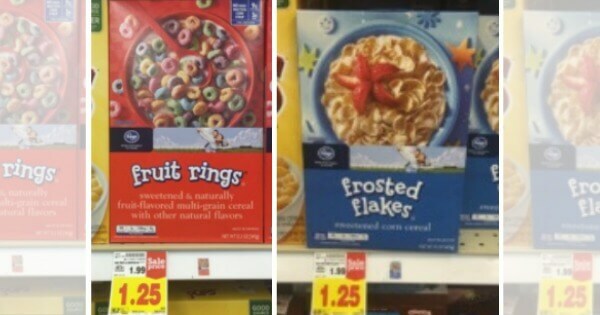 Consumers quickly learn whether store-brand “fruit rings” are a better value than Kellogg’s Froot Loops. Promotional activities and prioritization may nudge the marginal buyer and entice a first purchase, but cannot fool consumers over the long run. Cicilline’s letter cited Gene Kimmelman, the President of Public Knowledge, to allude that this specific merger would allow Amazon to “foreclose” competition. In antitrust, concerns about foreclosure are tied to the concept of an essential facility. For these concerns to be valid, access to Amazon’s platform must be essential — without access, competitors would be unable to sell food and/or unable to sell food online. In addition to being essential, there must be evidence of foreclosure — competing sellers are kept off of the essential platform. A key concept in antitrust economics is that of substitutability: whether one good or service is reasonably interchangeable with another. If there are reasonable substitutes for sales through Amazon’s platform, then the platform is not an essential facility. There are many reasonable substitutes for Amazon’s platform, including a network of retail stores and a standalone website with distribution through USPS, UPS, FedEx, and other delivery services. Indeed, Whole Foods and other grocers had and have operated profitably without selling through Amazon’s platform. Kroger provides delivery of groceries ordered online via Instacart and grocery pickup with its own service, ClickList. Safeway and Albertsons also offer home delivery of groceries ordered online. It the face of these observations, it is obvious that Amazon’s platform is not an essential facility. Thus even if Amazon keeps rival products off its platform, these competitors would not be foreclosed from selling their products. Those who argue that Amazon is an essential facility seem to be arguing the concept of essential facility is a matter of degree: If Amazon provided more favorable terms to sellers on its platform, those sellers would would earn more profits than than they currently receive. This flies in the face of the sine qua non of the essential facility doctrine–that the facility is essential. Amazon may be a useful platform to sell products. It may be a profitable platform. But, it is not an essential platform. Cicilline’s letter also seemed to suggest that the merger would result in reduced employment and lower wages. The letter claimed that “mounting economic research” indicates that the U.S. has experienced “decades of consolidation” and that such consolidation has led to a monopsony power in labor markets leading to lower employee wages. The letter’s reasoning echos conclusions of a report published by the Institute for Local Self-Reliance (ILSR), an advocacy group for “community-rooted” enterprise. Cobbling together statistics, anecdotes, and assumptions, the report formulates logical fallacies about Amazon’s effect on the retail job market. The title itself, Amazon’s Stranglehold: How the Company’s Tightening Grip is Stifling Competition, Eroding Jobs, and Threatening Communities, conjures a dystopian fever dream. The ILSR report claims that “Amazon’s tightening hold on our economy…, increasing dominance …, and ability to crush smaller rivals and block new firms from entering markets … is hobbling job growth [and] propelling economic inequality.” At the same time, the report ignores how efficiencies provided by Amazon’s e-commerce platform may actually have beneficial effects on employment—and it fails to address whether, when retail jobs are negatively affected, there might be offsetting gains in other areas, like lower prices. Manne and Maclean indicate if e-commerce platforms continue to appeal to buyers and sellers, this may mean fewer traditional retail jobs —or it could simply mean a shift in the types of activities performed by people in retail occupations. It might also mean more jobs in manufacturing, transportation, advertising, coding, and logistics, to name a few. In fact, information from the Bureau of Labor Statistics shows that employment in warehousing and storage has grown by more than 50 percent since the pre-recession peak. Over the same period, average hourly earnings have increased by more than 20 percent. Over the past year, average hourly earnings for these workers have grown at approximately the same rate as the average across all employees. Cicilline’s letter noted that Blue Apron’s initial public offering price was reduced by a third following the announcement of the Amazon/Whole Foods merger. However, two weeks prior to the merger, market observers were predicting Blue Apron’s IPO would be a disappointment. A Forbes contributor provided three reasons investors should “gag” on Blue Apron’s IPO: (1) unprofitable growth with costs growing faster than revenues, (2) competition from rivals including HelloFresh, Sun Basket, and Purple Carrot, and (3) weak shareholder protections associated with the two founders retaining a large portion of the voting shares of stock. Since the Amazon-Whole Foods merger, Blue Apron’s new, automated facility failed to ramp up as planned, resulting in late orders, missing ingredients, and higher costs, according to the Wall Street Journal. Cicilline’s letter noted that the announcement that Amazon would purchase Whole Foods had a “similar effect” on what he describes as the “traditional retail grocery market.” The letter identifies Walmart, Kroger, Costco, and Target as Amazon’s competitors in this market. In this way, Cicilline appears to abandon the FTC’s view that Whole Foods operates in the “premium natural and organic supermarkets market.” Instead, the letter implicitly concludes, Whole Foods competes in a larger market that includes grocery stores, supercenters, and warehouse clubs. Missing from Cicilline’s letter is the observation that the day before the Amazon/Whole Foods merger was announced, Kroger announced that it reduced its profit outlook by 10 percent. The same day—one day before the merger announcement–German grocer Lidl announced the locations of the first 10 stores to open in the U.S. More than a month before the Whole Foods purchase was announced, discount grocery chain Aldi described plans to invest $5 billion to open nearly 900 stores and remodel hundreds of other stores throughout the U.S. The entry of new competitors and expansion of existing competitors is at odds with speculation of consolidation in the retail grocery sector. Since the merger, Kroger’s share price has increased more that double the rate of growth of the Dow Jones Industrial Average. One year is too soon to judge the competitive impacts of the Amazon-Whole Foods merger. Nevertheless, it appears that much of the populist antitrust movement’s speculation that the merger would destroy competition and competitors and impoverish workers has failed to materialize.